Viola’s 9th birthday fell right after our “Animal Kingdom” trip to Disney, so we pushed the party back a few weeks until the weather was a little bit warmer--- it’s hard having an April birthday! I’m really glad we did because the weather was beautiful the day of her party and the kids had a lot of fun playing in the yard which we are never able to do in April. Viola loves animals and wanted to do an “Animal Themed” birthday party. Having just returned from Disney this quickly turned into a Jungle Cruise themed party--- I’m not sure whether this was more her idea or mine! On our trip we also ate at the Skipper Canteen for the first time and that was definitely another bit of inspiration for this party. (Skipper Canteen, by the way, is definitely my new favorite Disney restaurant!! )I had so much fun – maybe too much fun! – working in a bunch of Jungle Cruise nods that I’m pretty sure nobody got except me and one other person (thanks for laughing at my jokes, Doug!) 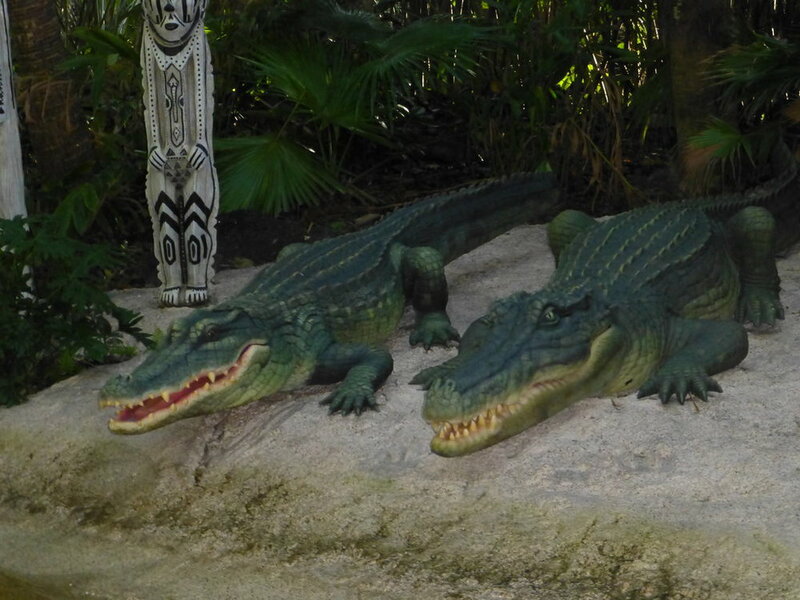 So, for my own edification, I’ve included the Jungle Cruise references along with this party blog post! You can check out my pinterest inspiration board for more ideas! Animals! – Animals was the theme of the day, and the girls pulled up every “wild animal” stuffed animal that they had in the massive hoard of stuffed animals. We had monkeys and owls and snakes and cheetahs and tropical birds and more, oh my! 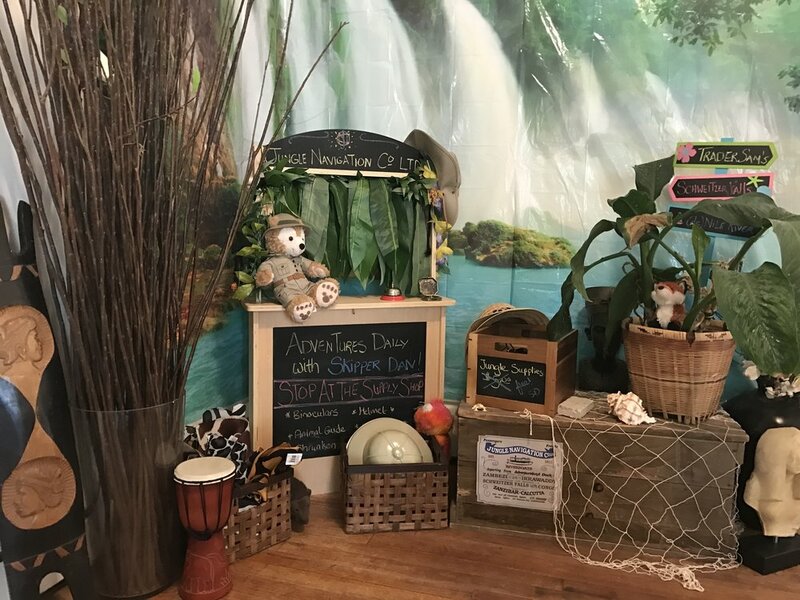 Room Wraps – We used a combination of room wraps from previous parties: the tiki wraps from our Luau party, and the waterfall wrap that we used for our Moana party a few months earlier. Because we pushed Viola’s party back until it was warm, we didn’t cover the windows because there was no snow to hide. Jungle Navigation Co. port – We turned our front area into the Jungle Navigation dock. The kids picked up their safari gear and animal scavenger hunt check lists here. We had lots of Disney souvenirs, props from previous parties, stuffed animals, houseplants, … not to mention all the ‘artifacts’ that we have as part of our home décor, to make a great vignette. I brought the jungle Cruise, Swiss Family Tree House, and Tiki Birds posters up from the basement playroom, along with the girls’ lemonade stand, too. I printed up a bunch of posters and pinned them to our pin board with a selection of Animal Kingdom Disney trading pins! It was cute… even if no one else got the jokes! Basecamp – The girls share a sparkly pink princess teepee, which we used for basecamp. In keeping with the theme, though, I covered the pink sparkly tulle with grass skirts from our luau parties. On the jungle cruise, basecamp had been infiltrated by curious gorillas, so we added a few stuffed monkeys to our teepee. Again, I’m pretty sure no one got this joke but me…. Regardless, lots of fun was had playing in the teepee. Schweitzer Falls – the water room wrap from our Little Mermaid party was repurposed as a waterfall to cover up our fireplace… Schweitzer Falls, to be exact! 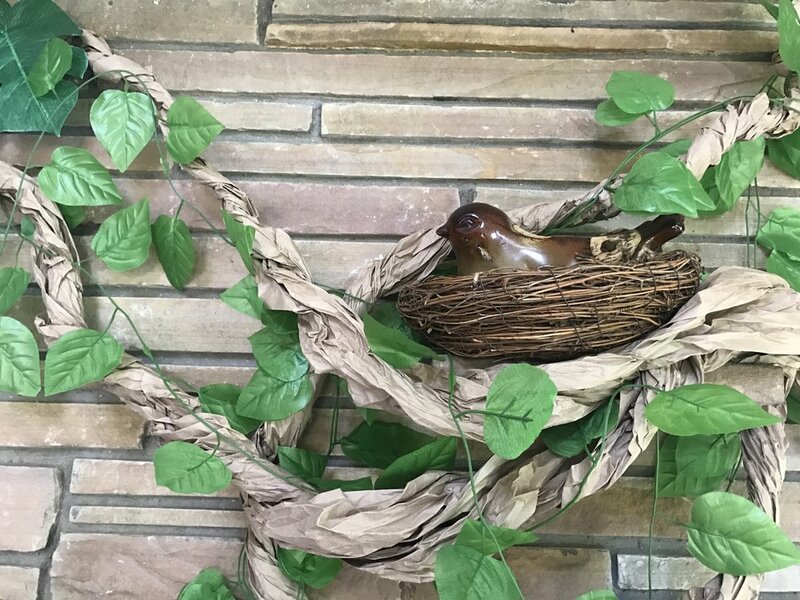 Some brown paper vines and strategically placed leafy vines, and the ol’ ring toss alligator completed the look…. Though I’m pretty sure only myself and 1 other person got the Schweitzer falls reference or the sign that said “backside of water”! Tables - We did not bring out the spindles that we usually use for our parties because Viola and her friends have gotten too big for sitting on the floor! (gasp!) so we added all the leaves to our dining room table and had the kids sit around that… which was mayhem. I much prefer there little tables! But we were able to reuse our luau trim with some inexpensive leaf-print vinyl tablecloths I found at our local party store. Trader Sam’s Cannibal Buffet – Our buffet for this party consisted of fruits, trail mixes, sandwiches cut in animal shapes, creepy crawly bug candy, and blue water bottled from Schweitzer falls! The biggest hits, though, were the platter full of ZEBRA CAKES and the watermelon slices cut into gingerbred shapes… what else would you expect from Trader Sam’s Cannibal Buffet?! Jungle Waterfall Cake – After the success I had with the Moana cake (http://www.princessrants.com/princessrants/2018/4/5/moana-party ), I decided to give it another go with this “jungle waterfall” cake. I followed the same instructions of freezing the layers before frosting, and used Piroulines again for that bamboo/tropical look. I alternated chocolate and vanilla and the hardest thing was keeping my family from stealing them! I purchased candy leaves, flowers, and butterflies and lots of sparkly blue sprinkles for the waterfall. Inside, the cake layers were dyed darkening shades of green. The kids loved the cake and I loved the final look. I can’t wait to make another one! 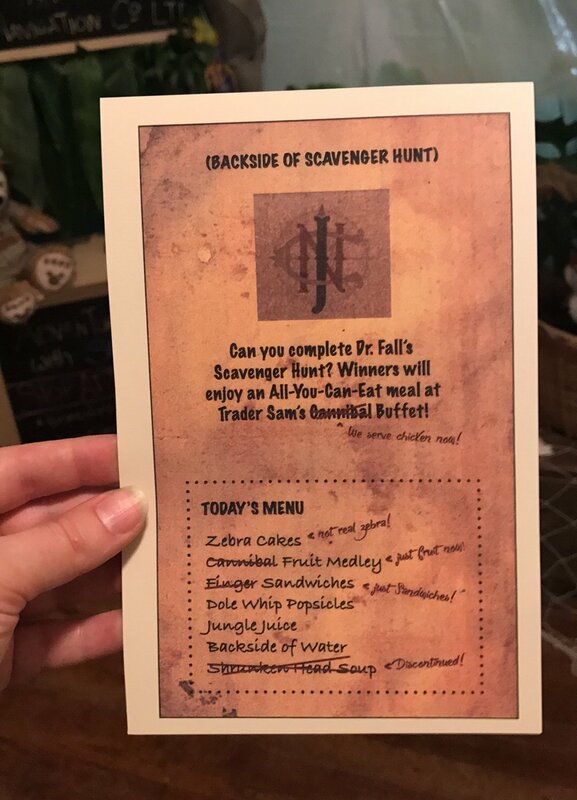 Animal Scavenger Hunt – When the kids arrived their first stop was the Jungle Navigation Co. Dock, where they picked up their safari gear and their Animal Scavenger Hunt card I had created to match the stuffed animals that the girls had hidden throughout the house and yard. This was our first party where it was warm/dry enough for the kids to play in the yard, and it definitely helped having them outside for a portion of the day. This was Viola’s 9th birthday and since the kids are all getting older, I forwent the carnival style games and goodie bags that we normally have done! The scavenger hunt kept the kids busy while our main entertainment was set up. 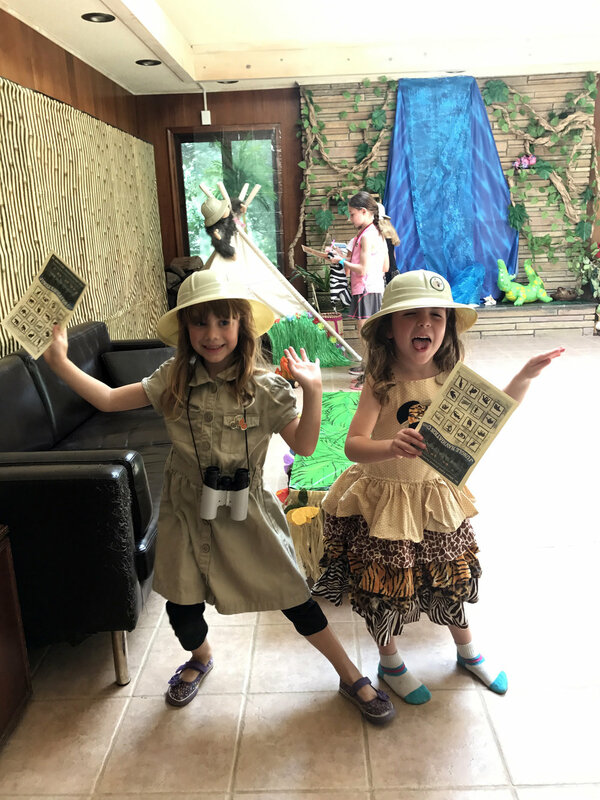 They returned their completed scavenger hunt cards to me to receive their goody bags and – of course – they got to keep their safari gear! I also bought a roll of round animal stickers that looked like badges and gave them out to the kids throughout the day and they stuck them to their safari helmets. Goody Bags – Goody bags were fill of animal print novelty items – pens, fans, candy, fuzzy notebooks, as well as little plastic animal figurines. The kids also received binoculars, plastic pit helmets, animal print bandanas, and canteens. Animal Education - The main event of the afternoon was a visit by Mark Rosenthal from Animal Magic and his amazing animals. The kids learned a lot about animals and were able to see a lot of different ones including tarantula, sloth, a baby fennec fox, snake, and others. Mark was so knowledgeable and the kids LOVED chatting to him. He kept them occupied for hours! If you are doing a party in SE Michigan I would absolutely recommend him! This theme was so much fun for me! We had so much that we were able to reuse from previous parties that I barely bought anything at all for this party. It was pulled together rather quickly and looking back at the photos I keep thinking of more things that we have that we could have used --- how did I forget to bring up the African Chief’s chair and giant butterfly kite? We should have totally put the family tent up in the back yard, too! Maybe we Eva is older I will have the opportunity to do this theme again!! She has been particularly obsessed with Tamatoa and his shiny song. So it was no surprise to me that when her birthday rolled around a few months later that we’d be having a Moana-themed event. Unfortunately, because the movie was so new that they weren’t many party products available or pinterest-inspiration to be had. 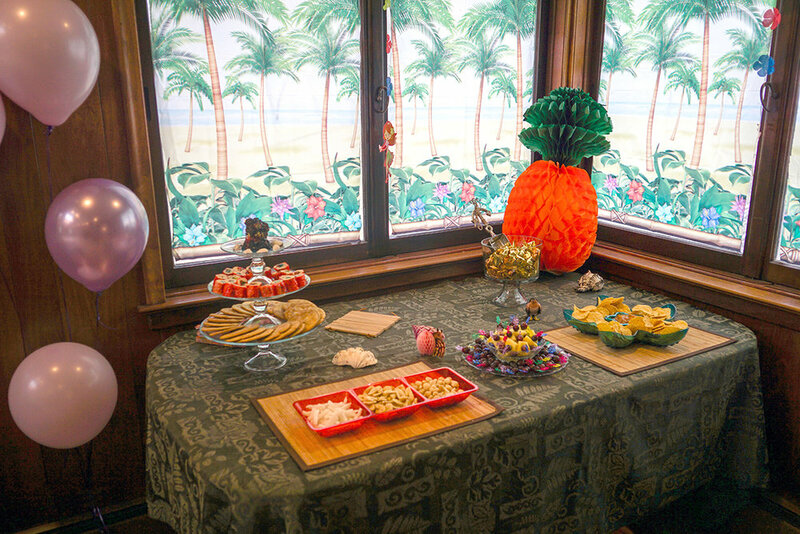 On the other hand, since we’d already thrown luau and mermaid-themed parties, I felt fairly confident putting a Moana party together and was really excited to get started! Eva actually wanted a party devoted solely to Tamatoa, but I was able to persuade her that a Moana-themed party would probably make more sense. We love re-using party supplies, which is why after every party I carefully take down the decorations, peel the tape off, wrap them up neatly and store them away in giant tubs. My husband makes fun of me, but when Eva decided she wanted her birthday party theme to be Moana, I knew I was all set and had 90% of what I would need to put together a great party for her. And, bonus, the decoration were even cut to size already, which made decorating super easy! Table decorations – Our spindle tables, also, were reused from the luau party with cute grass skirts and tiki mugs filled with tropical flowers, as well as tiki mask plates! Shiny! – We pulled out the trusty ol’ pirate treasure again for our Tamatoa trove of shiny gold goodies to disguise the fireplace. Lanterns/Balloons – We strung paper lanterns across the room and mixed the saved sea turtle balloons with new hibiscus patterned helium balloons. Picture spot – I was able to find a promotional Moana standee which I paired with a new waterfall room wrap to create this cute picture spot in the front room. It was a good excuse to buy some new houseplants, too, since I’d killed all of our other houseplants (I have since killed these ones too, alas.) 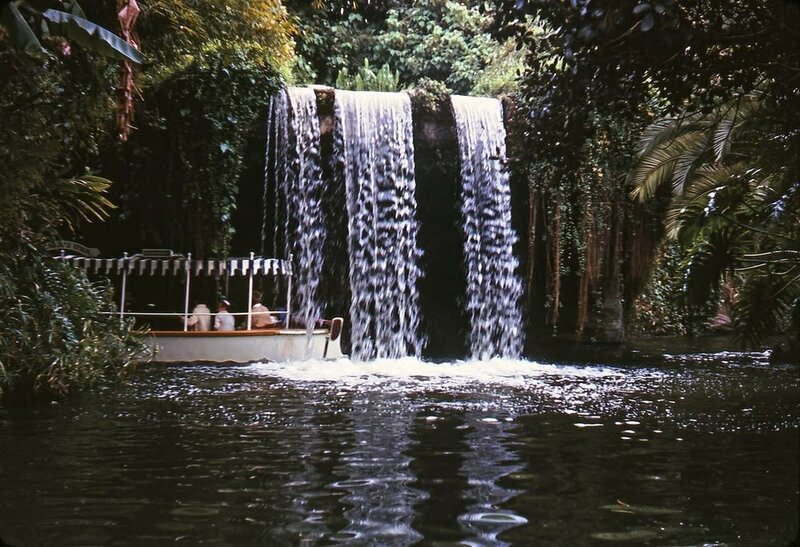 The waterfall was reused a few weeks later for our Jungle Cruise party! Luau Lessons – Miss Fran from The Polynesian Dancers of Michigan joined us for this party since the dance lesson from the original Luau was such a big hit. The kids loved learning about the types of dancing native to island cultures like Moana’s. Games – We do carnival style games where the kids can collect the ‘prizes’ for their goody bags. For our Moana party we did the Limbo, pineapple bowling, and collecting seashells and shiny treasure from the sand traps. The sand relay race was also a big hit again! The prizes were pretty much the same as our Luau party, so if you’re looking for ideas definitely check out that post here. Hula skirts, luau bears, hibiscus patterned toys and little party games, candy, etc. Coconut bowling ended up being cut short because the girls were really curious to find out what that "sloshing sound" was inside of the coconuts, so we broke one open and they tasted the coconut milk ... which they all agreed was 'deeescusting!' and tasted like soap! Buffet – We did a scaled-down version of the same food we served for our luau party. Despite the fact that I LOVED the pineapple upside down cake and dole whip, those weren’t huge hits with the kids, so we stuck to candy sushi, sand dollar cookies, and I ordered a pineapple pizza which perplexed many of the kids who chose cheese instead. Le sigh. For party candy, we of course had to have a dish full of all the shiny gold candy we could find! The cake - Eva is a bit ‘spoiled’ in that she has seen several of these parties now and has opinions when it comes to what she wants for her parties. She was particularly particular about the cake which she described in detail and even drew a picture of! 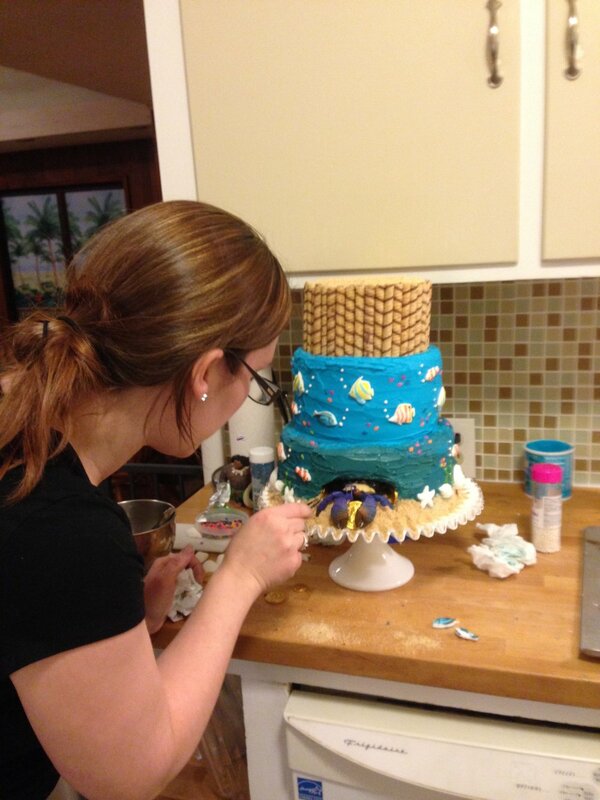 This was my first time doing the cake myself (our friend Becky had done our Ariel and Luau cakes, and I had to call her several times for advice/support as I was going through the cake making process!) I learned a lot of tricks that made it easier than I was anticipating! Namely, Becky told me the secret was in freezing the layers before frosting so that the frosting would go on smoother. WHAT?! That would have never occurred to me, but it worked like a charm! Eva wanted a cake that was “the ocean” and went “down to the realm of monsters”. I carved out a section of the bottom of the cake (which I reinforced with a hidden Tupperware) to create Tamatoa’s cave full of shiny gold coins. For a first try at making a birthday cake, I’m very proud of how this turned out! The exciting unveiling of the party was Eva’s ‘big present’ which was actually a very small HERMIT CRAB! Which, of course, was named Tamatoa! All in all, we had a lot of fun and made great memories. Now that we've thrown a handful of parties, I am getting more comfortable taking on more things myself, like the cake and photography (which was done by my husband) than I was with earlier parties when the girls were younger. I can't wait for the next one! You know how it is with second children—they seem to get a little less than their first born siblings. Less photos, more handmedowns, etc. With Viola we had birthday parties every year. In hindsight, I wasn’t sure that that was time, money, or effort well spent as those early parties she didn’t really enjoy or even remember. With Eva I decided that we would only do “big” parties from age 5-9 (10 and beyond I figured both girls would be wanting to do slumber parties instead of the themed extravaganza’s we’d been having). The early parties with Eva were simple family affairs. We got our cute photos of her eating cake or smashing an ice cream sundae and that was that. Easy peasy lemon squeezy. 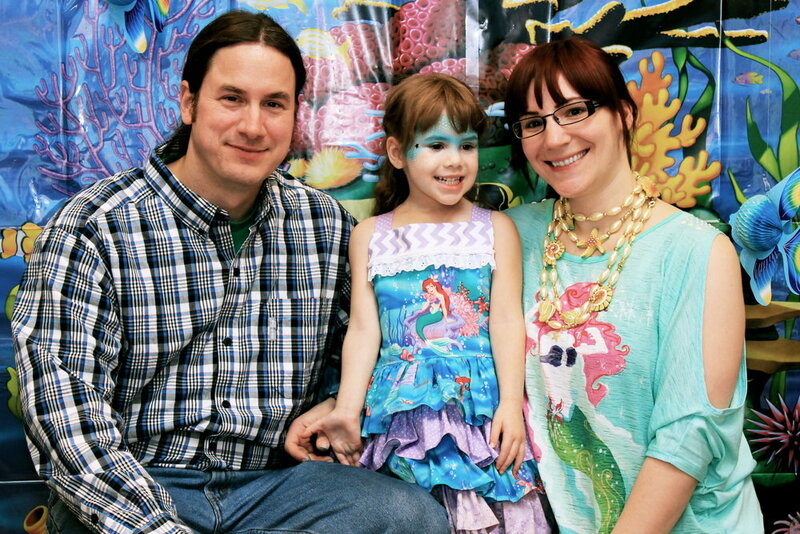 All was going well until a few months before Eva’s 4th birthday when she started planning her party—herself! She began telling anyone who would listen (grandmas, nanny, preschool teachers) all about the birthday party she was going to have when she turned 4, and they relayed the information to me much to my surprise. 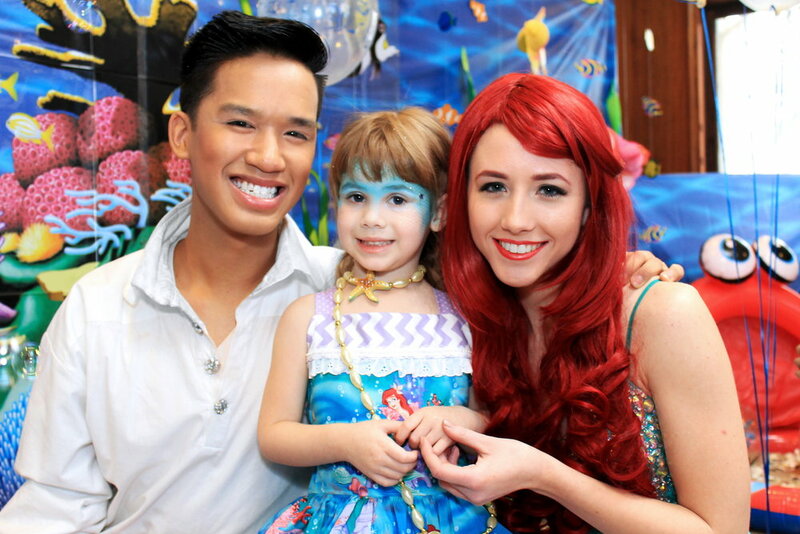 She was very particular: it would be an Ariel birthday party, with fish balloons, and a “tall, tall, tall” fish cake, and Ariel and Prince Eric would be there, too. Suffice to say, this was all news to me. But she was so adamant about it and so adorably particular that I just couldn’t help but break my own rule. And so we had an Under-the-Sea themed birthday party! (For more ideas, you can check out my Pinterest Inspiration board here). Room Wraps – I am a big fan of room wraps because they’re an inexpensive way to really transform a space. We like to cover our bookshelves in our party room with a room wrap to keep the kids from touching the knick-knacks on them. For the Under-the-sea party we found ocean themed room wraps which we added a coral reef overlay to. Seaweed – I used twisted green crete paper to create seaweed around the room, too. Fish, Fish everywhere – I bought several types of paper and inflatable fish which we strung from the helium balloons overhead, and attached to the walls. We found helium balloons in various fish shape, including sea turtles and dolphins, which we let loose in our high-ceiling’d room. I attached green streamers to the strings to look like seaweek and enhance that “under the sea” feel. Small clear and blue balloons (half inflated) served as bubbles. Sunken pirate ship – We reused the pirate ship from our pirate & princess party as well, and pretended it was a “sunken ship”. Ariel’s Grotto - We covered the fireplace in fishnet and re-used some of the pirate treasure from our Pirate&Princess party to create Ariel’s “grotto”, complete with inexpensive candelabra full of silverware of course! Table settings – We reused the spindle tables (honestly, those things have gotten so much use! ), with Ariel-themed tablecloths and more fishnet. I also found fish confetti which we sprinkled about. We re-used the stacked clear dishes as centerpieces that we had from our Frozen party, which I filled with seashells, and the shabby chic teacups/teapots from our Pirate/Princess party as well. BUBBLE MACHINE – no under the sea party would be complete without a BUBBLE MACHINE. I personally hate bubbles (gasp!) but when I commit to a theme I commit 100%! Buffet - The buffet included starfish sandwiches (PP&J cut with a star shaped cookie cutter), “SeaFoam” (blue cotton candy), candy sushi, seaweed grape kebobs, goldfish served with a fishnet, clam cookies, seaweed salad, a watermelon sharp, blue jello cups with happy banana dolphins, and more! I found cute sea creature kabob sticks which I liberally stuck into all the food! Cake - The bakery where we usually get our birthday cakes had gone out of business a few months before our Ariel party. Our friend Becky offered to make the cake and WOW! did she outdo herself! I bought ready-made blue icing and a variety of sugar fish; because Ariel is Eva’s favorite character, we already had on hand lot so Ariel decorations from her doll set that we were able to use for the cake. Becky used crushed nilla wafers to make the sandy sea floor bootom and green sour straws for seaweed. BEST.CAKE.EVER! Facepainting - Eva remembered the facepainter we had had for her sister’s party, and this was one of the details she’d ‘planned’. She wanted everyone to have mermaid scales facepaint. Unfortunately, since we were planning this party super last minute Cindy was unavailable, but with the help of the internet and a little experimentation I figured out how to get the mermaid scale effect using fishnet stockings and blue/green face paint! 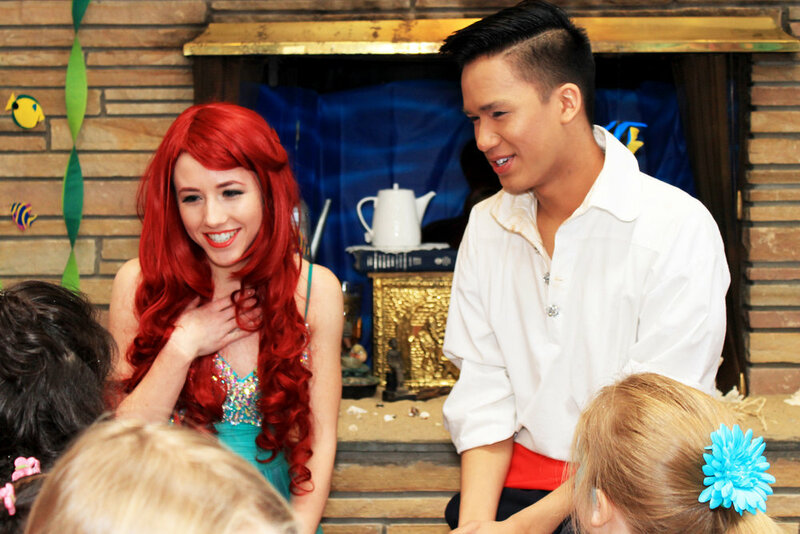 Storytime – Prince Eric and Ariel came for storytime and to visit with the kids and to take photos. The kids LOVED chatting with them and singing along to some of their favorite songs. Games – The kids played a variety of games to fill their goody bags with prizes. We had octopus ring-toss, magnetic fishing, and ducks floating in water like at the carnival (does that game have a name? ), as well as crab sandbox that the kids could dig through and keep the treasure that they found (reused from our pirate party). Once again: sand throughout my house for weeks, but SO WORTH IT! Each girl received a sandbucket to collect the goodies she won in the carnival-style games (every one was a winner! 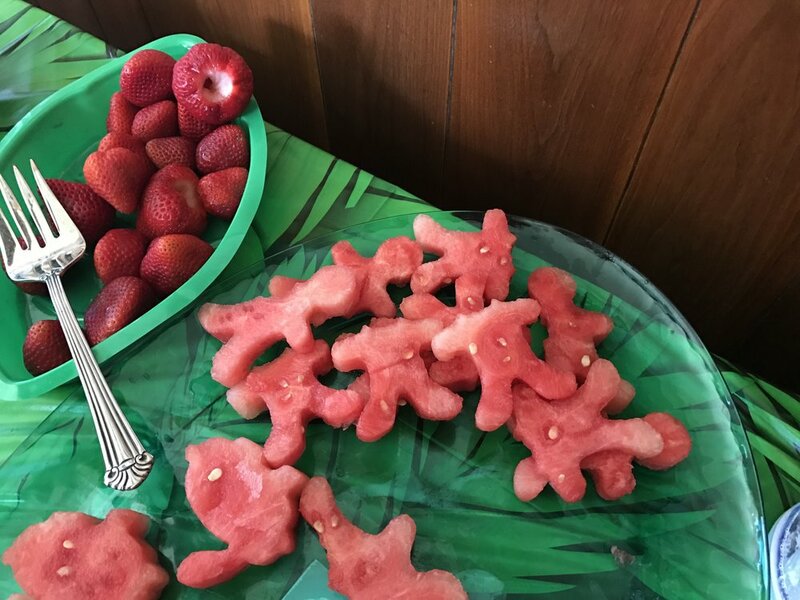 ), which included seashells with fish and seashell shaped soaps/bath fizzies (fishing station), mermaid-themed rubber duckies (duckie station), seashell necklaces (ring toss station), pirate treasure (sand station), and fish-themed candy from the buffet. Re-use is a big theme in our house and part of how we are able to have such “big” decorated parties is by creatively reusing and recombining elements from other parties. The Mermaid party was two months before our Luau party, so a lot of the same decorations were re-used for that party, which helped me justify the cost knowing that they’d be used at least twice. 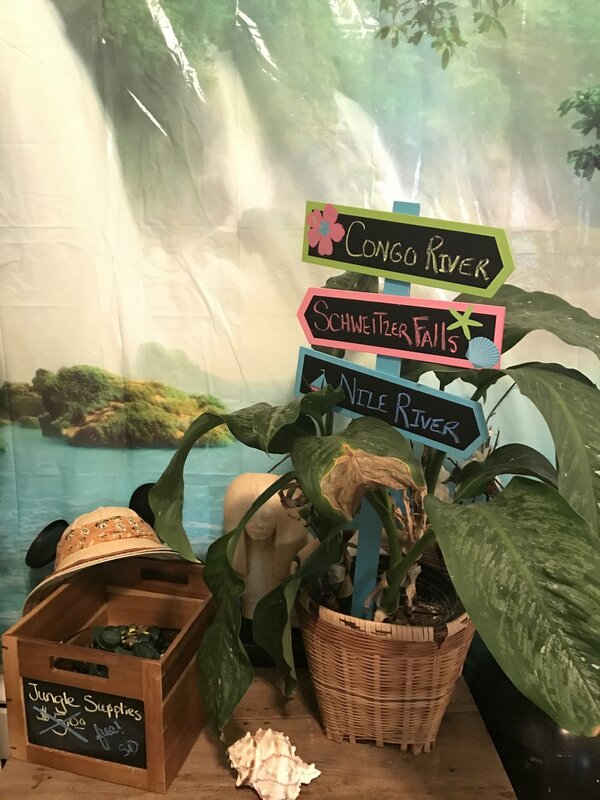 At the time of writing this post they’ve gone on to be used 3 more times… for Eva’s Moana party, Viola’s Jungle Cruise party, and as set decorations for a community theater play the girls were in! I’m so glad I “gave in” and let Eva have a party a year early. She still talks about her Mermaid party. I learned lots from this party – how to facepaint, and how to bake tiered cakes! – and have so many great memories! 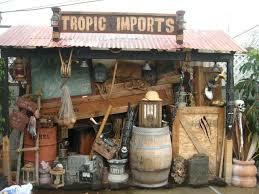 Decorations & prizes were purchased from OrientalTrading, PartyCheap and Amazon. How Agile Saved My Big Fat Overly-Complicated Wedding! Photo by the amazing Adam Sparkes, superb groomsman and photog extraordinaire! I try to avoid talking about my "real life" on this blog. I like to stick to parties and Disney and craft projects instead. However, you should know that these are all things I do in my spare time. By day, I work as a User Experience Designer for Fortune 20 companies helping to make software that you've probably encountered at some point in your life. The work I do to bring those apps and software products to life is engaging and interesting to me, but probably not so much to people outside of the field. I've worked in this capacity for over 10 years and most of that time has been in Agile environments. Agile is a philosophy used to organize team work, primarily in Software Development groups. The concept of Agile can be traced back as early as the 1970’s, but formally crystalized with The Agile Manifesto for Software Development in 2001 and went on to transform team dynamics at large and small companies. I’m a big believer in Agile because I’ve seen it work wonders, and because I am a ‘type A’ person who loves lists and making plans. Agile provides a system to get things done, and there’s so much I want to get done in a week! I tend to take on “too much”, or so I’m told. Big birthday parties, trips jam-packed with activities, an endless list of ideas for craft projects that I want to do…. My wedding was no exception to this. In fact, it was the culmination of all my grandiose party planning, hyper scheduled vacation, and craft goals. Eventually (inevitably) I became overwhelmed and things started falling through the cracks. Given the cost of the wedding and the fact that we’d waited 10 years to do it, failing was not an option. And so I turned to the Agile process to help me accomplish everything I dreamed of accomplishing in the time I had left. This was not our first foray into Agile at home. We'd begun incorporating Agile into our parenting process the previous summer, to help our girls begin learning how to budget their time and reach their goals, as well as negotiating and pitching in as part of a family with shared objectives. I’d been inspired by a TedTalk about Agile Programming your family. Those experiments really helped open up communication with our kids by making them 'stakeholders' in the work that had to be done at home, while also celebrating their incremental accomplishments. The wedding, though, took this to a whole new level. In addition to all the wedding tasks that keep ‘normal’ brides busy, we were having a destination wedding (at Walt Disney World, no less), and I’d decided I needed to: design & sew the flower girl dresses, invent a new style of bouquet that I made myself, design and fabricate overly complex invitation booklets, plan everybody’s Disney trips for maximum overlap, learn to waltz, put together thoughtful welcome gift bags for each family attending, and thoughtful gifts for my bridal party that included custom Mickey ears, and a million other things that I don’t even remember anymore! Me: "No flower girl dresses in the same fabric as the bridesmaids dresses? No problem!" Me: "Sparkle belts cost WHAT? I can make those myself." Somehow I decided I needed to find thematically appropriate ear hats for each guest, even if I had to make them myself! Sometimes you have to resort to child labor when you design entirely overly complicated invitations. That's why they have those little, nimble fingers. As we got closer and closer to the event, I found myself snapping at my fiancé and our kids. My house was falling apart, cluttered with a zillion half-completed projects, and I was losing my mind. It wasn’t fun anymore. I’d taken on these projects because I wanted to do them --- I enjoy crafting, I enjoying being able to respond to a compliment with “thanks! I made that! !” but I wasn’t enjoying these projects anymore. So, we started our Agile Wedding Process and it saved the day (literally!). In the hope that it might help others out there feeling overwhelmed by their own "too much", I've decided to share the basics here if you want to try these techniques yourself. The team has a certain amount of time — a sprint (usually two to four weeks) — to complete its work, but it meets each day to assess its progress (daily Scrum). Now, I realize that's written in hyper software speak. But this process works at home too and I'm going to break down how we used Agile in the context of completing all the tasks required for our wedding and how you might be able to use it, too. We sat down one night with a fresh pack of sticky notes and wrote out everything that needed to be done for the wedding. In Agile these are called “User Stories”. A key part of writing stories is that you break down big to-do's into their component tasks. For example, making bouquets was not 1 sticky note, it was 10. There was one task for buying the materials. Another for finalizing the design. Arranging the bouquets. Wiring in the lights. Wrapping the handles. And, finally, packaging them up in their shipping boxes to send to our Disney resort. I have a good friend who is an Agile Coach by day and a Life Coach by night. She always talks about establishing “SMART goals”, and I try to keep those in mind when I’m making my “stories”. · Specific – What are you setting out to do/make? · Measurable – How will you know you are “done”? · Achievable – Is it realistic? Do you have the skills? * Is the time period reasonable? · Responsible – who will do it? · Time – how long will it take? *Note, if you want to accomplish something but don't have the skills for it do not despair, you just need to make a story for learning those skills as a step before taking on the task! Back in my college days I took a class in productivity skills for artists and one of the tricks I learned was that before you sit down to work on something, you should take 5 minutes and write out everything that’s on your mind. Literally everything from call mom to start eating better to write great american novel goes down on the paper. Holding these in your head steals mental processing energy away from the task you want to complete and writing them down lets your mind relax and focus on what you’re sitting down to do. I still do this exercise many times per day – especially before meetings where I need to be mentally present. If I find myself feeling distracted I flip to a clean page in my notebook and jot down what’s distracting me. Once it’s safetly down on paper my mind has permission to “let it go” for the time being. You'll find that just the process of writing out what needs to be done will help you feel so much more focused! The next step is to put all of these stories onto a “scrum board”. Some people use their refrigerators, a whiteboard in their living room, bathroom mirror, etc. Basically any open wall will do. For our wedding, because we had SO MANY sticky notes, we used our corner window in our breakfast nook. You’ll have to develop a system that works for you. The goal of the Scrum board is to make the work & progress visible to everyone on the team. The most common approach I’ve seen is a board with three columns and a row for each teammate (in this case, family members). The first column has all the sticky notes that are in the backlog. The second column are just the stickies you’ve identified to work on in this period. The third column is completed stickies. Personally, I find a great deal of satisfaction is tearing the stickies down when a task is complete, so my board only has 2 columns: backlog and in process. Don't be afraid to experiment! Find what works best for you. Grab two-weeks worth of tasks from the ‘backlog’ you made in step 1 and put them in a new area of your board. If you're having trouble estimating what two-weeks' worth of tasks is, it sometimes helps to look at each sticky and give it it's own time estimate (i.e., one hour to address the invitations) and then grab the sticky notes that equal the amount of time you have available to devote to your project. In Agile, we organize our work into what’s called a “sprint”. A 2-week sprint is most common. You gather up the sticky note stories that you think your team will be able to accomplish within 10 days and identify who is responsible for completing each one. The goal is to get everything (or as much as possible) done by the 2-week deadline. Note that no story should be bigger than two weeks, if it is then it needs to be broken down into smaller stories. I'm a believer that you should “load” your sprint with extra stories (called “stretch goals”) that you can accomplish if you finish your other tasks early. Competition with yourself and other teammates helps you push to accomplish more: in Agile the number of stories you are able to complete is called your “velocity”. I'm always trying to increase my velocity: ie finish more in this sprint than I did in the last sprint. (yes, you can cheat by giving yourself easier stories, but that defeats the purpose and you're only cheating yourself!). The stories you’ve decided to tackle in this “sprint” are moved from the backlog to the “current” section of the board. Remember that this is a discussion with your teammates (family). They are indicating what they are willing and able to do by the deadline. I want to be clear: you are not “ASSIGNING” work to them. You can certainly negotiate with them, but they HAVE to “opt-in” that they are going to complete the work or I guarantee that those sticky notes will not get cleared. Trust me. Without genuine buy-in from your family, the system doesn’t work so don't bother. They have to WANT to finish the tasks too. Your job is to find out what tasks they can and will do in the time period and move those to the active section of your board. It's all about pushing yourself psychologically to accomplish more by having laser focus and a desire to move the sticky notes across the board. Hack your dog brain, as they say. Wedding planning was unique in that we were managing a lot of deadlines that didn’t fit neatly into 2-week “sprints”. There were appointments and dance classes and due dates and shipping dates and all kinds of dates to keep track of OR ELSE. To accommodate this, we modified our board to have a calendar. Each day was represented by a half-sheet of typing paper with the date on top. Onto that we put any important deadlines that we needed to track. Then we started divvying up the sticky notes making sure that all the tasks associated to a deadline were arranged BEFORE the deadline. This really helped us organize what needed to be done when, so that we focused on the tasks that were due first vs. those we were more excited to get started on but weren't due until closer to the wedding. If a task didn’t get completed by the end of the day it moved over to the next day and so on. I’m happy to say that we didn’t miss any of the important deadlines with this approach. (For those familiar with Software Development, this is more of the “KanBan” style). Once per day the team (family) gathers together in front of the Project board to discuss their progress. They move sticky notes around to indicate what they are actively working on and what has been completed. If they have a sticky note that is assigned to them that they are not able to complete for whatever reason (this is called a “blocker”) they discuss with the group what is blocking them and the group’s job is to help eliminate the blocker. Perhaps Sue’s task is dependent on Joe finishing up something else. The daily standup is the opportunity for Sue to communicate with Joe and let him know how his incomplete task is affecting her. This should help motivate Joe to complete his task. I find it helps to do this in the morning so that what needs to get done is fresh in everyone's mind as they start the day. This is also why we chose to keep our board in the breakfast nook: a very central, visible place that we almost always spend time in first thing in the morning. Standup should only take a few minutes. If folks aren't sure what to say, you can use this template: "What did you do yesterday? What are you going to do today? Do you have any blockers?" At the end of your sprint / beginning of your next sprint the team comes together to discuss what they’re going to tackle. (Once per week or every two-weeks, or whatever time increment you’re using for your family sprints). For teams that don’t throw away sticky notes as they’re done, you’ll start sprint planning by reviewing and removing the completed stories from the last sprint. With kids this is a great way to acknowledge and celebrate their accomplishments, which helps keep them motivated. You might also do a quick “sprint retrospective” which is a chance to talk about what in the process went well, what didn’t go so well, and what could be improved in terms of the process. This is definitely important in the beginning when you're working out how the process will go for your family (an example, if the board isn’t working you could discuss an alternate way of setting it up or location in the house for it to be). Then, it’s time to start planning for the next sprint. Just like in Step 3, you are going to go through all the stories in your backlog and decide which ones you're going to tackle before the next deadline, and move those to the active part of your board. Then, take a look at ALL the stickies in your backlog: are they all still relevant? Are there things you thought you were going to do that now you don't think you need to or you could drop? Are there new things that have come up that you want to make space for? This process is called “backlog grooming” and it’s what allows agile teams to adjust so that they’re always working on the most relevant tasks. You'll need to order the stickies by priority. Look extra carefully at the sticky notes that you've ranked as lowest priority: are you really going to do them? If not, let those tasks go. My Agile Coach friend often says that this is the hardest, but also the most important, part: letting go of the things that you don't really need to do. Agile helps reduce conflict/stress and increase productivity because it makes work visible and organizes communication, focusing the team on immediate goals and that all lead to long-term, steady progress. These same principles work at home too. A family is a team and your family can benefit by learning new ways to work together, communicate effectively, and achieve shared goals. I hear friends and coworkers complaining all the time about a spouse who isn’t pulling their weight at home and leaves everything on mom to do even though mom works. This leads to simmering resentment. While of course there are husbands who are lazy, I believe most people want a healthy marriage and a functioning home and are willing to pitch in to get it, they just don’t know what to do. Women are notoriously bad at the whole “I’ll just do it myself!” thing, when what they really want is their whole family pitching in to help them. There is greater accountability with an Agile process, and less frustration AT each other (as opposed to WITH each other). When we decide together what our goals are, everyone is more willing to pitch in. We’ve used the Agile process at home for both ongoing organization of everyday tasks and big event goals like a wedding, party, home improvement projects, and moving. I’ve heard of folks using it to set more emotional family goals like “yelling less” or “being kinder to each other”. Though Agile is designed to help groups work together, I also use many of the same tools myself when I’m starting a big project on my own as a way to organize myself, even though it's just me. Like I said above: just the act of writing down and breaking out tasks helps to focus your mind and effort. Whatever you’re trying to tackle, I’d encourage you to give Agile a try. It doesn’t cost anything aside from a package of sticky notes, and could make all the difference in reaching your goals! As for us, our wedding was a success! I completed all the projects I set out to do with the help of my family (and some friends!) And, I even found the time to learn to waltz! Super detailed invitation with planning booklet? Done. I pulled together some articles by others who’ve used Agile to hack their families. Enjoy! I am not a for-profit blogger, nor am I affiliated in any way with the Walt Disney Company or any entertainment company. I don't collect ad revenue or have sponsors, the thoughts and opinions expressed here are solely my own.